The Margarita Studios 17 distinctive guest bedrooms, suites, apartments and houses located throughout our resort, are completely renovated and transformed into deluxe rooms made for one, two or three quests, for couples, or families, for singles or for honeymooners, into elegant suites and into stylish stone houses. All materials are connected to the area of Paros, the people and their origin, Cyclades. introducing a new accommodation concept, offering more than just comfort but an entire living experience .All details is chosen with care. 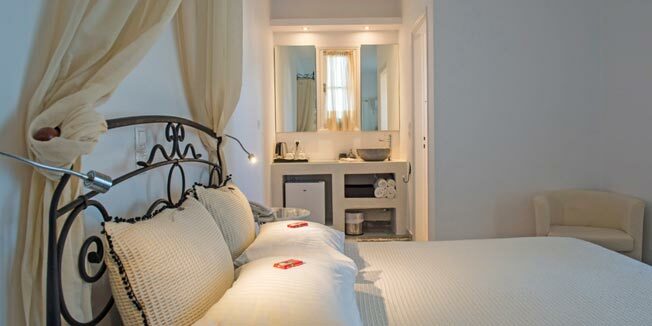 The emphasis is placed on natural materials such as marble baths , natural greek fabrics to create the desired ambience. With complimentary Wi-Fi and breathtaking views, you’ll have no problem unwinding and feeling right at home. 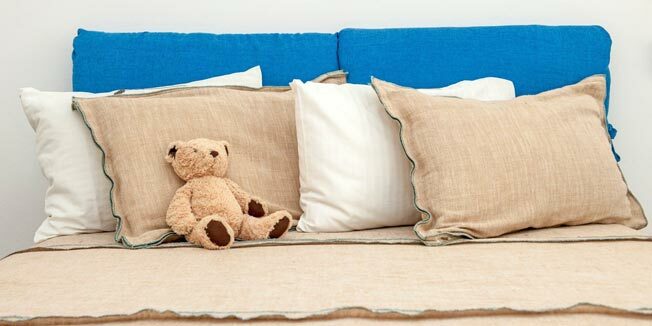 Our mission: to provide our guests with exceptionally biological clean & high quality linen and towels. 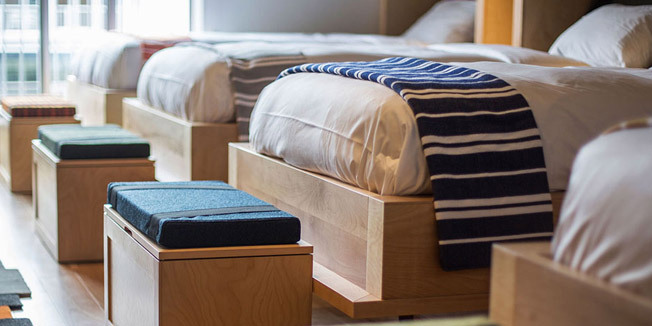 Spotless rooms, crisp linens, fluffy towels and super cheerful service ! 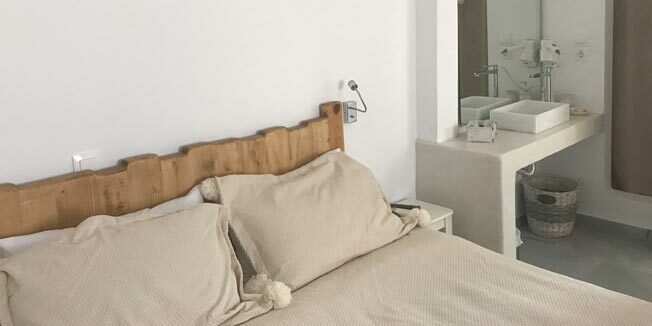 all of our bedrooms are equipped with a flat screen Plasma Freeview TV, generous hospitality tray and a hairdryer. History, luxury and tradition coexist, in order to serve our guests' needs. No matter how beautiful the backdrop attentive, human staff is the real secret weapon behind a successful boutique hotel. Ultimately, it's all about service and attention to detail is evident in everything we do. We have a private car-park and offer assistance with unloading suitcases to all guests from a drop-off point directly outside the hotel. We offer help in reserving taxis, cars, scooters etc from our local partners office.There is a regular bus service to the village of Naoussa with stops within 500m of the hotel. Margarita Studios is spread throughout three buildings – composed of the main building with two floors and two more independent bungalows. 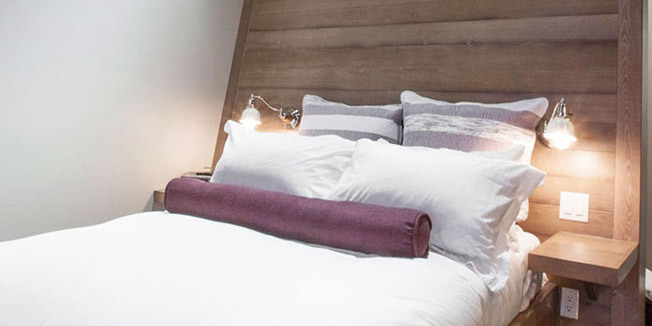 Whether you wish to escape for a romantic weekend, a relaxed family break or you simply want to get away from the hustle and bustle, Margarita studios is just the ticket. - Suites Pink and Green and our vanilla triple superior apartment are on the ground floor, next of our blooming garden, easier for wheelchair users . 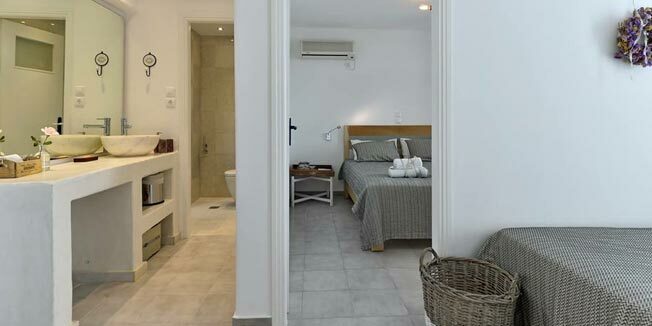 - On the first floor are our twin, double rooms offered also as for single occupancy. - Behind the main building and next of the pool, there are our family apartments. - On the right of the main building there are our stone houses, easier for wheelchair users . - Our Restaurant and the swimming pool are on the left side of the main building and the car parking on the right side. All rooms are clearly signed and whilst they are not indicated in Braille type, a member of staff would always be available to guide a guest to their rooms at whatever time of day or night they needed help. For travellers not traveling with a lap top, PC or other smartphone, a computer is available free of charge to check your e-mails or make other research on the net. Assistance dogs are welcome. Room service is available throughout the day with meals available at certain times of the day. There is a telephone in every bedroom. 0 for direct dial , call charges with hotel supplement are automatically metered. Grass-fed, free range, organic - we strive to serve you food that is healthy, local, natural and tasty. The hotel’s spacious restaurant is assessable to wheelchair users. We are also sensitive to requests for quiet tables and special seating for children. Menus are clearly typed and can be read to the guest on request. Chef can adapt meals for special dietary requirements with advance warning. Cooking lessons & active holiday packages offered. Wedding planning, social events hosting by the pool. Choose the accommodation that suits you!